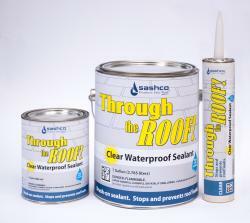 When your roof requires a water-tight surface, use Through the Roof by Sashco ® Through is a roofing caulk – it can even be applied in the rain. It sticks to damp surfaces, which means you can repair the leak while it’s still leaking. Through the Roof will adhere to nearly any roofing surface type – metal, plastic, asphalt, wood, concrete, and more. In addition, it won’t freeze up. So go ahead and repair that gutter in a Minnesota winter. You may get some worried stares from your neighbors, but they’ll be thankful the subsequent time you host a neighborhood bash and their head stays dry.